In 1990 Jon Gibson released one of my favorite albums, Jesus Loves Ya. One of my favorite songs on the album is called Preacher Man. This song reminds me of my Dad, Bruce Ingle. When this album was released Dad had recently gotten his ministers license. Whenever I hear the song, I think of dad. My dad was born in 1950. He says he came to know Jesus when he was the rottenest, most vile sinner at the age of 4 (Yes, he has that type of humor). 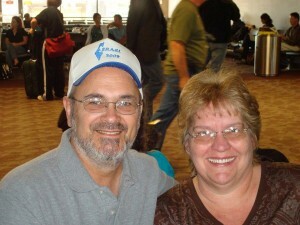 He met my mom at Pentecostal Bible College in 1971 and was married in January of 1972. He got the best gift of his life, me (Sorry, Nate) in 1973. Then my brother came along in 1974. We grew up in Southern California. He was ornery, like my Poppy, and had a habit of hiding and scaring the life out of us. He was very patient about it too. One time he hid under Nate’s bed for over 2 hours to scare him. He has also done other things, that people in the church couldn’t quite believe until he started practical joking them! Dad worked at a Rental yard for a long time, 18 years I think. He never wanted to become a pastor. His dad was a pastor, as was his Father-in-law, and he and mom agreed they were content just working in churches. As we grew up, Dad passed along his love of music to Nate and me. The first time I ever sang with him was in Perris, Ca. I was very, very young, and we sang “I Get A Little Closer” by the Imperials. Dad played his guitar, and I held the mic, hidden behind the pulpit with my back to the congregation, and sang my little heart out. I’ve always loved singing with my dad. When we became teenagers, Dad would always take Nate to baseball games, and me to concerts. He endured many Kim Boyce, Jon Gibson, Bryan Duncan, The Allies, etc. concerts. Dad likes a wide variety of music. The first concert he ever took us to was to see Jake Hess, JD Sumner, Rovie Lister, James Blackwood, and Rosie Rozell. I didn’t realize the history of Christian music that was in that room until I was older, but it was a great time. My favorite place Dad and Mom would take us was Christian Nights at Knott’s Berry Farm. About 3 times a year, Knott’s held from 8 pm to 2 am a huge Christian concert. Dad, Nate, and I would go from concert to concert. One time while waiting for the Allies to play we couldn’t find dad; all of a sudden we looked on stage because people were starting to clap and there was dad walking the stage with Randy Thomas, who played the guitar. Pretty soon our friends were yelling, “Bruce, Bruce, Bruce.” Then the whole crowd was yelling his name. It was pretty funny. Later the same night, we went to see DC Talk. Dad disappeared again. He climbed up a rock wall and lay on his side next to speaker be bopping to the music. Pretty soon Toby Mac strolled over and shook hands with him. My dad was pretty stinking cool. Dad began in my teen years to feel a call to pastor. In 1993, he was elected to a church in Northern California in a town called Susanville. He and Mom have been pastors up here in Northeast California for 18 ½ years. I am happy to serve as Music Director under his leadership. While growing up, Dad and Mom taught us how to have faith in God. Whether it was good times, or bad they always remained faithful. Thank you, Dad, for your unwavering faith and raising me to know God. I love you. Oh yeah, Happy birthday! !